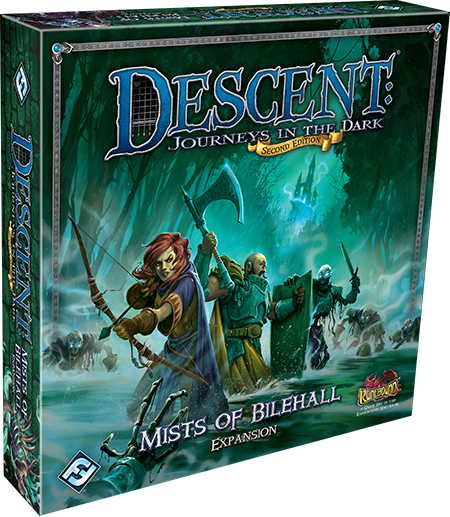 Fantasy Flight Games is proud to announce Mists of Bilehall, a new expansion for Descent: Journeys in the Dark! The Mistlands of Terrinoth have long had a dark reputation. Evil creatures that live nowhere else thrive here and servants of Waiqar the Undying have made their dwelling places within this land of endless fog. Even worse than the evil creatures and monsters that lurk within, the mists of Bilehall have been rumored to have a malignant effect, tainting even the noblest soul once it has ventured within the Mistlands’ borders. 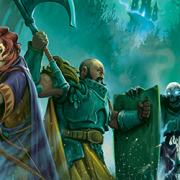 Now, tales of an undead horde massing at the border of the Mistlands have led you to investigate what noxious plots have formed in the darkness. 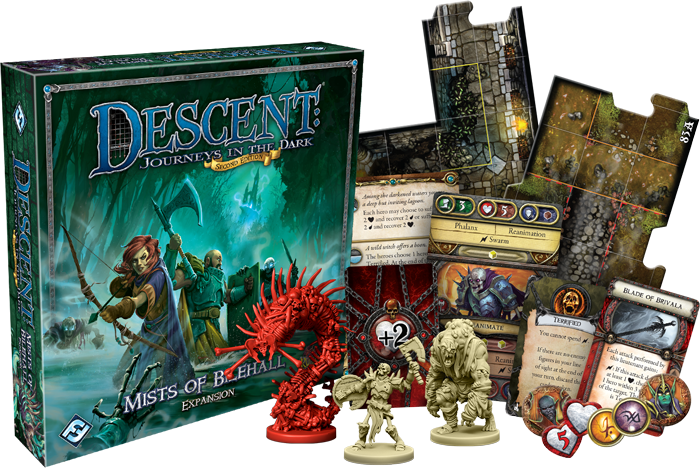 Mists of Bilehall is a new expansion for Descent, and it challenges a small group of heroes to travel into the darkness and danger of the Mistlands. 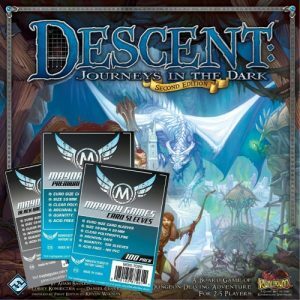 A full, one-act campaign is included in this expansion, chronicling the heroes’ adventures and the dark deeds perpetrated in this misty realm. 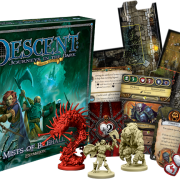 What’s more, no new heroes or hero classes are included in this Descent expansion: instead, the Mists of Bilehall has been configured to enhance the power of the overlord. To that end, your army swells with twelve sculpted plastic figures – six reanimates, three broodwalkers, and three bone horrors. 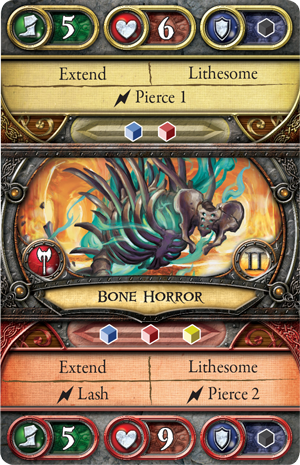 The very ground may give way beneath the heroes with the introduction of old walls and crumbling terrain, while the evil of Bilehall influences the heroes through the introduction of tainted cards. Even the doughtiest heroes will be hard-pressed to survive in this land of mist and half-truths. In addition, three new lieutenants join the overlord’s armies in this expansion. For more information on these lieutenants, visit our announcement of the Mists of Bilehall Lieutenant Packs! As the heroes make their way through the Mists of Bilehall campaign, they will soon find themselves plagued by uncertainty. Heroes are not welcome in the Mistlands, and the land itself may betray them without warning. New, unstable terrain features are introduced in Mists of Bilehall: old walls and crumbling terrain. Old walls are additional walls erected in the middle of rooms that block movement and line of sight. More importantly, these old walls are often surrounded by crumbling terrain, which forms tenuous pathways over the hazardous swamps of the Mistlands. When a hero enters a space with crumbling terrain, he may test either Knowledge or Awareness. If the hero passes the test, he continues unharmed, but if the hero fails, the crumbling terrain gives way and plunges the hero into water, sludge, or something far deadlier. The heroes must also contend with the pervasive, corrosive influence of the Mistlands. 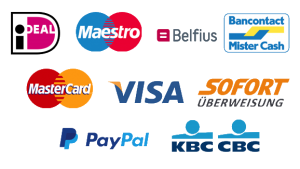 To represent this during the Mists of Bilehall campaign, the overlord deals a facedown Tainted card to each hero at the start of each quest. While the hero possesses a Tainted card, his health is increased by two, but when he’s knocked out, he must flip his Tainted card faceup. 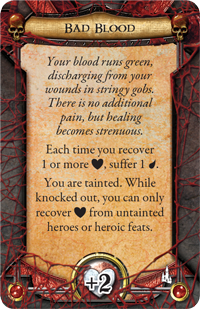 For example, your Tainted card may be Bad Blood, which forces you suffer a strain every time you recover damage. In addition, while you have a faceup Tainted card, you are tainted and can only recover damage from untainted heroes or heroic feats! While the individual effects of a given Tainted card may vary, you can be sure the toxic effects of the mists have proven deadly to heroes before. You’ll also gain more tangible threats in Mists of Bilehall alongside crumbling ruins and tainted mists. Three new monster groups and three new lieutenants join the forces of darkness, eager to lend their nightmarish powers to stop the heroes. You may call upon a horde of reanimates to form a wall against the heroes. 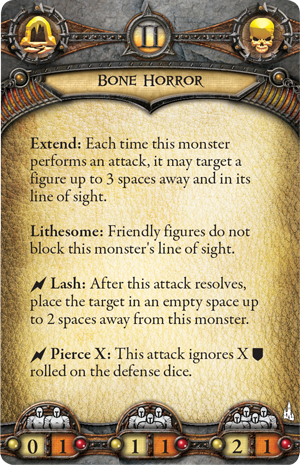 These monsters fight best in a solid formation, where they can draw strength from the other undead who stand to either side. Alternatively, you may spread disease and corruption with the terrifying broodwalkers – corpses animated by a massive hive of corpse bugs working in unison, searching for fresher flesh into which they will lay the next generation of their young. 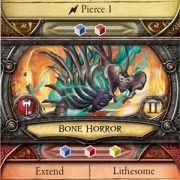 You may even sight the legendary bone horrors: living masses of bone that can reach and move with astonishing speed. Only the bravest or most foolish heroes will confront these fast and agile constructs head-on. Three new lieutenants also join the fight as the heroes move forward into Waiqar’s domain. As the overlord, you can enlist the services of Ardus Ix’Erebus, a master tactician and an undead warrior. Kyndrithul the vampire offers dark sorcery to the servants of the overlord. Alternatively, you may ally yourself with Zarihell, an elf of unknown origins and allegiances, who commands the spirits of the dead wherever they may lie. You can supplement these lieutenants with Plot decks and sculpted plastic figures with their Lieutenant Packs. For more information, visit our announcement of the Mists of Bilehall Lieutenant Packs. The mists are already around you, and unnameable monsters creep beyond your sight. The only way to escape is to go forward, into the depths of the Mistlands, and stop the overlord’s evil plot – but already, you feel your noble intentions draining away in the corrupting fog. Can any hero survive what awaits in the Mists of Bilehall?